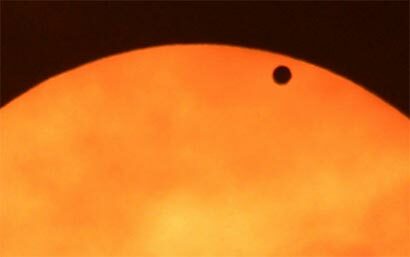 Planet Venus (R-black spot) transits in front of the Sun seen from the Observatory of Obuda, in Budapest on June 6, 2012. Astronomers and novice star-gazers worldwide trained their eyes and telescopes on the skies on June 6 for the last chance this lifetime to observe Venus track a near seven-hour path across the Sun. The event, only to be seen again in 105 years, began shortly after 2200 GMT on Tuesday, visible first from the Pacific and north and central Americas as a small black dot trailing across the solar surface.